Traffic jams are the worst and clearing them is no easy task. 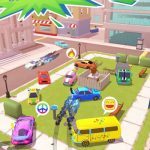 Tiny Cars: Fast Game puts you in charge of ensuring the intersections run as smoothly as possible by giving you the power to freeze and unfreeze cars at the tap of a finger. This brand new traffic simulation game for Android and iOS devices may seem simple at first. You just need to tap on a car to make it stop, then tap on it again to let it pass once it is safe to move. It is a lot more challenging than you may expect. Cars will be few in earlier stages, but as you progress, more cars will be coming from all directions. You will need lightning fast reaction times as well as absolute focus in order to keep the cars from crashing into each other. 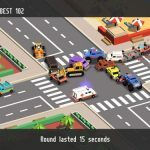 If you find yourself in a five-car pile-up, it may be time to rely on our Tiny Cars: Fast Game cheats, tips and tricks for some much-needed help! 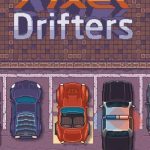 When you start out in Tiny Cars: Fast Game, you will only have to deal with regular cars. Later on, the intersections will start changing. More challenges will be added as you progress in the game. Soon, you will encounter bigger vehicles like the train. While you do have the power to stop cars by tapping on them, trains behave differently. You cannot freeze them no matter how many times you tap. All you can do is time the freezing and unfreezing of all other vehicles to ensure they do not collide with the train. Since the goal of the game is to keep cars from crashing into each other, even a single incident will end your run. This is only true, however, for cases where one car T-bones another. If a car just gets rear-ended, it will just be pushed forward, putting it at risk of a crash. When this happens, you still have time to save it by unfreezing before another car hits it. To help minimize the risk of rear-end crashes, it is better if you choose to stop cars on longer roads. This will give you more time to unfreeze them once you see another car come in. The game lets you purchase more car types using the regular currency. When you unlock a new car type, it will appear on the roads more regularly. This is more than just a skin change, though. Newer cars will reward you with more money whenever you complete a level. This will help you earn more money faster, allowing you to unlock even more expensive cars. The higher the price of a car, the more money you will earn from it once it hits the roads. Another reason to unlock newer cars is to help you clear levels faster. More expensive cars fill your completion bar faster. Needless to say, the faster you complete a level, the less likely that an accident will occur. While you have the option to play the game offline, it is actually better if you do so while connected to the internet. Ad offers will pop up after each round when you are online. Accepting these offers will double the amount of money you earned from that round. Since you want to be able to unlock more cars faster, you need to take advantage of every opportunity to earn more money. Watching more ads will do that for you. Even though it is recommended that you unlock newer vehicles, there are some vehicle types that you should avoid putting on the streets. These are the longer vehicles like the big rigs. Longer cars may be worth more money, but they also increase the risk of crashes by a lot. You won’t really earn from them if you keep failing levels because they took too long to clear an intersection. Keeping intersections clear and accident-free is definitely challenging. 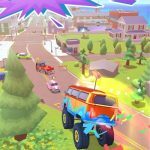 Make sure you remember all our Tiny Cars: Fast Game tips and tricks if you want to succeed! I have reached a level of 140. Many more to go.